During the hearing in war criminal Muhammad Kamaruzzaman’s appeal case yesterday, presiding judge of the four-member Appellate Division bench Justice Surendra Kumar Sinha said he had been a member of the infamous Peace Committee during the 1971 Liberation War. Also known as Justice SK Sinha, the judge said he used to pass information to the freedom fighters in the nights. For the first time since independence, as there is no such record available, a judge sitting in a court has revealed his role and affiliation with the anti-liberation force. Leaders of Jamaat-e-Islami, Muslim League and other parties formed Peace Committee to collaborate with the Pakistani occupation forces shortly after beginning of the war that killed around 30 lakh people and when over 2.5 lakh women violated. 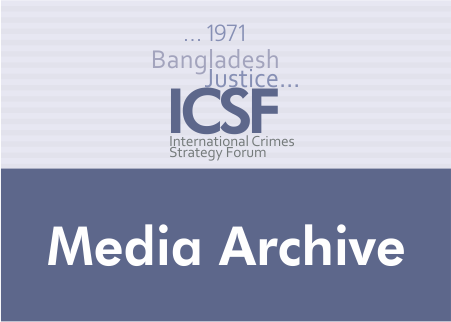 According to records, formation of the Peace Committee was initiated in consultation with high officials of Pakistani Army after the launch of the barbaric crackdown on unarmed Bangalees on March 25 night in 1971. After saying this, the judge looked at Justice Md Abdul Wahhab Miah sitting next to him with a smile. “To save life,” Justice Wahhab laughed. The court broke for lunch at 11am. The bench started the hearing at 10:07am. Mahbubey continued the argument he started on Tuesday on charge number one. The court quizzed the AG about Makbul Hossain, from whom prosecution witnesses Fakir Abdul Mannan and Dr Md Hasanuzzaman heard about the incident (Badiuzzaman’s abduction and killing) and why the prosecution had failed to note eyewitness Makbul’s statement. In response, Mahbubey said that the prosecution would not be destroyed by not using Makbul as witness. Mahbubey said that Makbul has changed. “You should have said he has changed his mind,” Justice Sinha said. During Tuesday’s proceedings, Mahbubey sought adjournment for two days since he was not prepared for the hearing and his assistant was absent. It irked the bench and Justices Sinha and Justice Wahhab took a swipe at him. The bench also criticised the International Crimes Tribunal prosecution for their incompetency. After the lunch break, Justice Wahhab pointed out that all the certified copies of the tribunal carried the Supreme Court monogram. The court on Tuesday also slammed the defence for not submitting the written argument it had asked for earlier. Kamruzzaman’s counsel SM Shahjahan submitted the document yesterday as per the court’s order. Shahjahan said that a submission would be made with the reply. The attorney general moved on to argue charge number two and continued arguing on the third charge. At the end of the proceedings at 1pm, the court did not mention when it would resume the hearing.